We don't have central air and I don't really care about that. If we did, we'd always be arguing about him wanting it on and me wanting it off. I only really want air conditioning at night. And really, only when it's humid and the sheets feel wet. I expect that when I walk into a store they will have the air conditioning on full blast, but in my house, not really. My parents have it in their house and while it's nice to be able to take a shower and dry off and get dressed and stay dry (luxuries one cannot have in a house without A/C) for a while, I don't have to pay a high electric bill for the summer months and I get to hear the great outdoors. And most of the time, we have a really great breeze around here and it's fine. For those awful days of 100% humidity, which used to only come in August and now see to come as early as May, we have a window unit that we put in and it cools the bedroom and the living room. Or should I say cooled. Because the other day, k-ster turned it on, left the house and when he came back, it was 100% off and will not come back on. It's not the outlet, we've tried others. I'm afraid it's dead. So, with some pretty wildly hot days this week, it turns out, we're living in a swamp. A week of rain made everything quite damp and now it's super hot and sunny so we're all steaming. There are places that still have standing water that I haven't ever seen that wet. My house is already smelling moldy and I don't normally actually smell mold, I just see it when it starts growing on the walls. I know that's gross but it's mostly in the bathroom. It's not like all of our walls are green and furry. That I know of. I'm sure behind them it's just a forest of mold, but I only care about what I see. This one of the many reasons the outdoor shower is essential! It's only early July and I fear for the rest of the summer. In the west, they have swamp coolers which blow air across water or ice to make it cool. It's pretty smart when you're in the dry, hot desert. Having water blowing around isn't much of a big deal and probably feels pretty good when skin is about to crack from the dry heat. Here, this would just add to our humidity issues, I'm afraid and I think we would actually grow mold on ourselves! Luckily, k-ster has found a solution that will probably work for us. We have fans, we have styrofoam coolers and I know there are pieces of gutters around here that aren't being used. 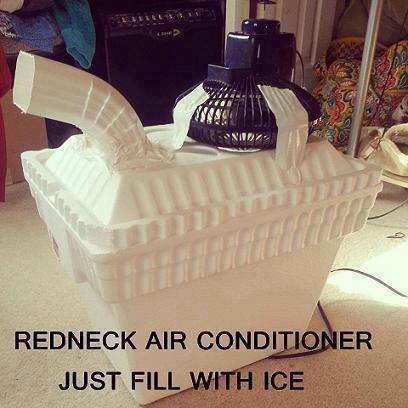 It will sure be a lot cheaper than buying a new air conditioner at the height of the summer heat! And no freon to ruin the atmosphere. Muggy heat is just about unbearable; I hope you can find someway to cool off soon. You're right about swamp coolers. They are great in the desert, but as soon as it starts getting "muggy" here (very relatively speaking! ), the swamp cooler fails to function properly. Haha - Interesting solution. We have a window unit in all bedrooms and one to cool the downstairs in our dining room. There is NO way I'd live without AC.